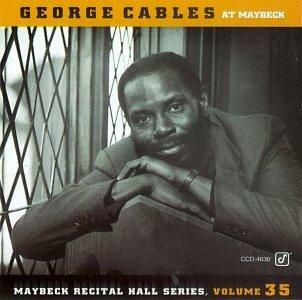 Locked right into the mainstream, the ever-reliable George Cables gets his shot at a solo recital in Vol. 35 of Concord's voluminous Maybeck series. From the opening track ("Over the Rainbow") onward, Cables immediately settles into the prevailing Maybeck idiom, sporting a do-everything technique rooted in bop, with frequent Tatum flourishes, Evans-influenced voicings, and standards as the specialty of the house. The core of the recital is a three-song, 18½-minute Gershwin medley ("Bess, You Is My Woman Now," "My Man's Gone Now," "Someone to Watch Over Me") which is perfectly listenable but doesn't shed any new or different light on these very-often-covered songs. The most interesting numbers are Cables' own haunting original tunes, "Helen's Song" and "Lullaby," the soulfully relaxed, down-home "Goin' Home" (from Dvorák's New World Symphony), and the circular riffs of the concluding Bobby Hutcherson tune "Little B's Poem."